Michael John Hoffman – Ci:hkwa:nahkwat (Meteor Cloud That Makes is Clear) passed away at home in the loving arms of his wife, Karen Ann on April 5, 2019. Mike was born February 6, 1950, the son of Raymond Felix Hoffman and Delores Arnott Hoffman. 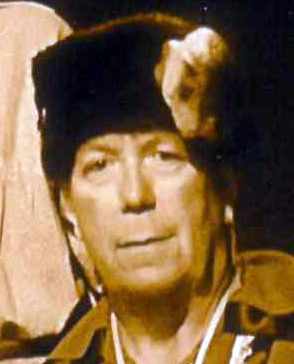 A Menominee and Ottawa descendant, Mike was a cultural advisor and consultant to the Menominee Clans Story, a collection of carvings by his cousin, the late James Frechette, Jr.
A fluent speaker of the Menominee language, Mike taught Menominee language classes with his adopted grandmother, Wahsecewan, the late Lillian Nelson. He spoke about language and culture at many venues across the state. Over a 30-year period, Mike researched many of the original Menominee place names for sites across areas of Menominee occupation. In 2013 Mike released “Kae:yas-Mama:ceqtawak Kaehke:wae:hcekan (Ancient-Movers, full of Life, Marked Thing So That You Will Know It)”, or The Menominee Place Names Map. Released online and in print in conjunction with the Menominee Clans Story at the University of Wisconsin-Stevens Point, this map recalls some of the Original Place Names Menominee People used throughout their homeland. The map can be seen at the Oshkosh Public Library, Wisconsin Historical Society, and Museum of Natural History at UWSP. A lifelong traditional bow hunter, Mike lived with the land, hunting, trapping, sugaring, gathering, and gardening. As an artist, he worked with paint on stone and ceramics as well as functional art like wooden yokes, spoons, drums, and ladles. Mike enjoyed train travel and visiting with his far-flung family of artists at Native Art shows across the country. Today, there is one less Indigenous Language speaker in the world. Another bit of cultural knowledge is lost. Love, laugh and visit with your elders while you can. Mike is survived by his loving wife, Karen Ann; sisters, Myra Hoffman and Virgean (Dale Ostrand); Kathy Horstman, the dear mother of his two children, Trent and Marla. Funeral Services for Mike will be held at 11:30 a.m. on Wednesday, April 10, 2019, at the Pisarski Funeral Home, 703 Second St. Ron Skallerude will celebrate the service. Visitation on Wednesday from 10:30 a.m. until the time of service at the funeral home. In lieu of flowers memorials in Mike’s name will be established at a later date.